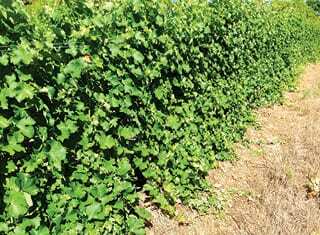 The effectiveness of grapevine canopies depends largely on the distribution of the shoots on the trellis system. With increasing pressure to recover higher yields per hectare, the number of bearers per running metre is being increased all the time. Traditional trellis systems, such as the VSP (Vertical shoot positioning system), are not able to accommodate the additional bearers and subsequent number of shoots. Bundled shoots and canopy compaction usually ensue. Bundled shoots usually cause compaction accompanied by a decrease in the number of fertile buds. Moreover dense canopies may result in increased disease pressure. Yellow leaves that form in the compacted zones of the canopy can also impact negatively on wine pH. The Smart-Dyson system attempts to accommodate additional bearers and shoots on the trellis system. This is achieved by upward positioning of the shoots, as well as downward, in order to utilise a bigger surface of the trellis system. This usually results in improved canopy aeration, as well as better bunch distribution. Improved aeration practices in the canopy have a positive impact on production, and may also improve wine quality. Furthermore this system may reduce canopy management inputs, such as for example suckering and leaf removal actions. 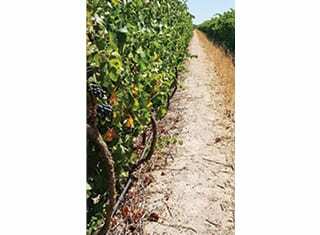 The vigour of the cultivar and rootstock combination, as well as soil potential, must be considered before a decision about the kind of trellis system can be reached. If this combination results in average vigour, it is preferable that a 2.1 m post be used (Figure 1). This system will typically be recommended for a combination, such as Pinotage on Richter 110, planted on medium potential soil. Should this combination result in medium-strong to strong vigour, however, a 2.4 m post is recommended (Figure 2). This system will be better suited to Shiraz on Richter 99, for example, planted on medium-high to high potential soil. FIGURE 1. A diagrammatic representation of the Smart-Dyson trellis system on a 2.1 m post. FIGURE 2. A diagrammatic representation of the Smart-Dyson trellis system on a 2.4 m post. The recommended cordon height for the 2.1 m post is 900 mm and 1 000 mm for the 2.4 m post. 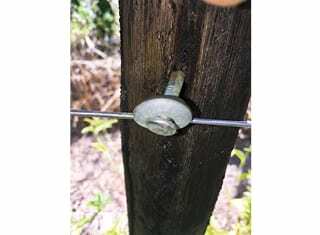 If the cordon wire does not go through the middle of the post, but is attached to the side of the post instead, it should preferably be attached to the opposite side of the bending wire. The reason for this is the space left by the thickness of the post for downward bending of shoots. The side on which the downward positioning of the canopy should take place depends on various factors, with prevailing wind direction, slope and row direction being some of the most important. The cordon should preferably be positioned on the side of the strongest prevailing wind direction. This will ensure that the cordon is not detached from the pole by strong winds, as well as ensure that the wind keeps the vertically positioned shoots upright against the trellis system. If planting takes place on steep slopes, the cordon should preferably be formed on the upper side of the slope. This will naturally cause shoots to be positioned downwards towards the bottom of the slope. This allows more room for downward growth. Lastly the row direction has a role to play. Experts in the industry differ greatly in their opinion about this practice. Personal experience has shown that two scenarios come into play. The first is when a vineyard is established from scratch on a Smart-Dyson trellis system, and the second is when an existing block is converted to a Smart-Dyson trellis system. In the first scenario I prefer to bend shoots towards the side of the canopy receiving the most heat. In other words in a westerly and/or north-westerly wind direction. The reason for this is that the downward positioned shoots are derived from bearers that were deliberately left on the underside of the cordon. Consequently these shoots have an almost 180° angle relative to the shoots that were positioned upwards. Therefore the bunches on these shoots hang on the inside of the shoots and are mostly exposed to morning sun. The risk of sunburn is thus reduced. An additional advantage of this strategy is that it leaves room for breaking out of leaves at the “back end” of the shoots that had been positioned upwards, notably the easterly and/or southerly side. Furthermore it simplifies the ease with which a mechanical leaf breaking action can be applied. In the second scenario an existing vineyard block is converted to a Smart-Dyson system. In this instance good judgment should be used. Here the side on which the cordon has been affixed to the pole will be the biggest consideration as far as I am concerned. Remember we want to position the shoots downward on the opposite side. Furthermore we should realise that the downward positioned bearers range from zero to few. The downward angle at which shoots will therefore be positioned will be much smaller than in the first scenario where a Smart-Dyson block is established from scratch. A bigger percentage of bunches can therefore be exposed to the sun on the side where the shoots are positioned downwards. In this instance it is therefore sensible to position the shoots downwards on the easterly and/or southerly side. It is advisable to use strong hooks with the bending wire, seeing that this wire is subject to high tension. A handy tip is to use roof nails, which are strong enough to handle the tension (Photo 1). PHOTO 1. A roof nail is used to position the bending wire. 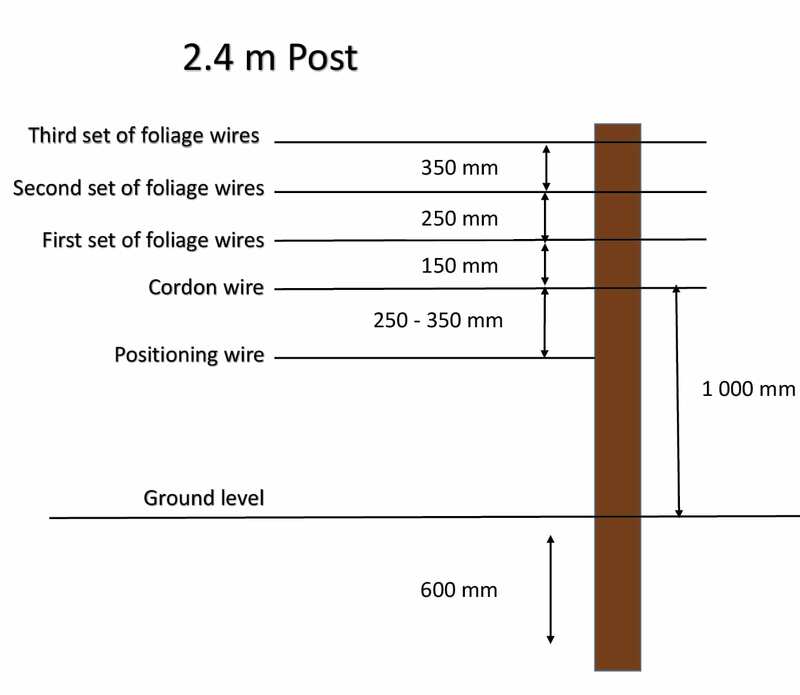 Note that the number of canopy wires, as pictured in Figures 1 and 2, only represents a general guideline and that the exact number of canopy wires will depend on the unique requirements of each block. 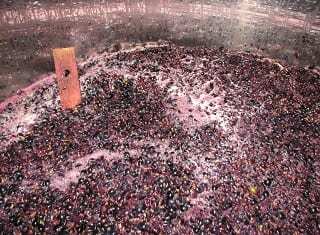 A cultivar with an upright growth, for example Cabernet Sauvignon, will probably require fewer wires than a cultivar with a relaxed growth, such as for example Merlot. The wind sensitivity of the terrain, as well as the cultivar, should also be taken into account. This decision should preferably be taken in consultation with your viticulturist. The distance between the bending wire and the cordon wire is also determined by the growth pattern, as well as vigour. 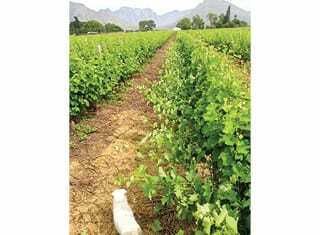 Upright, vigorous cultivars, such as Sauvignon blanc or Cabernet Sauvignon, usually require a slightly longer distance than relaxed, less vigorous cultivars, such as Merlot or Pinotage. If the distance is too long, many shoots in a downward position may become undone by wind, or may not even be hooked up properly. On the other hand, a short distance may complicate the raking out of shoots and cause them to break during the bending down/opening up process. In general this distance should not be shorter than 250 mm and preferably not longer than 400 mm. The trellising and grapevine development of a Smart-Dyson block is identical to that of an ordinary VSP system, bar one exception. During bearer spacing it is imperative to leave bearers on the top, as well as the bottom of the cordon. The normal spacing width of between 12 cm and 15 cm still applies. These widths are now applicable to the top, as well as the bottom of the cordon. When selecting bearers that will point downwards, preference should be given to bearers that are on the correct side. See Photo 2 for an illustration of correct bearer spacing. PHOTO 2. Correct bearer spacing above and below the cordon. Although the bearers are developed upwards and below the cordon arm from the start of grapevine development, it is very important to evaluate the strength of the trunk and cordon before the shoots are positioned downwards. The trunk should be strong enough so that the force with which the shoots is positioned downwards will not bend it in any way (Photo 3). Furthermore the cordon should also be strong enough so that the downward pointing shoots do not loosen the cordon arm from the wire and make it skewed. From personal experience the cordon should be established on the cordon wire for two years before downward positioning of shoots takes place. PHOTO 3. Skewed trunks as a result of shoots that were positioned downwards before the grapevines were strong enough. Pruning of a Smart-Dyson block is similar to pruning of a VSP system, except that short bearers are left above and below the cordon. Also try to leave two bearers per bearer position (“bokhorings”/double bearers) wherever there is a shortage of bearers. By so doing sufficient future bearers can be developed for the top and bottom half of the cordon. The bearer in Photo 4 is a good example of a bearer that can be pruned to a double bearer in the following season in order to develop both a top and a bottom bearer. PHOTO 4. Example of a bearer position where two bearers can be left in the following pruning season to develop both a top and a bottom bearer (black lines indicate the cuts). Because the bud load on a Smart-Dyson grapevine is higher than in the case of a VSP system, it is advisable to prune one bud bearers for at least two years after establishment of the cordon arm on the cordon wire. This will prevent overproduction. 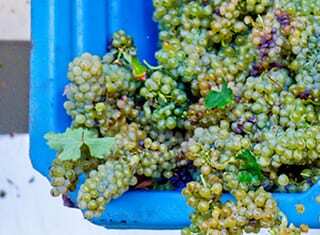 The vigour of the grapevine will be the determining factor, however, and the crop load should be discussed with your local viticultural consultant. As a result of the increased crop load associated with Smart-Dyson trellis systems, the intensity of suckering actions is usually lower compared to VSP systems. Opening up the canopy will ensure sufficient penetration of air to retain fertility. 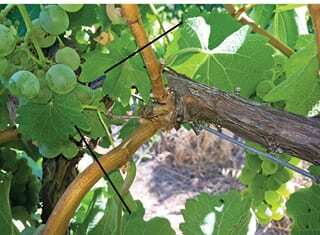 The primary objective of the suckering action is therefore simply the removal of weak shoots with the aim on even ripening. 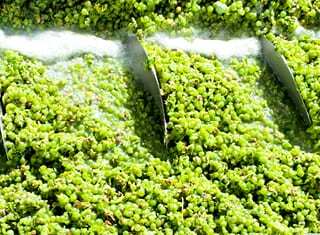 The first step during the process of opening up the canopy is to rake out the shoots that are positioned on the bottom bearers. Ensure that the bending wire is loose and can be removed from the canopy so that the shoots do not break off needlessly. This should take place at about 40 cm shoot length (Photo 5). Allow the bending wire to rest on top of the shoots that have been raked out so that they can become used to this position. PHOTO 5. Shoots on the bottom bearers are raked out at 30 cm to 40 cm shoot length below the bending wire whereafter the bending wire rests on top of the shoots. The next step is to hook up the bending wire in the correct position in order to flatten the shoots against the trellis system (Photo 6). The shoots should be at least 80 cm in length and this action should preferably take place during the flowering period. If the shoots are positioned during the flowering period, there is the added advantage of improved fruit set. A handy tip is to first position the back end, in other words the shoots growing upwards. It is then much clearer which shoots should be positioned downwards. PHOTO 6. The bending wire is hooked up in the correct position and the shoots are positioned. Normally intensive breaking out of leaves is not necessary, because by opening up the canopy light penetration is improved. In some instances, however (production blocks especially), it is necessary to open up the back end of the canopy. No topping or tipping action is required on the shoots that are positioned downwards. These shoots normally stop growing by themselves, because of their upside down position. Furthermore the mechanical traffic in the row will trample the shoots, thus serving as a tipping action. Judicious topping and tipping actions are still required on shoots that grow upwards, just as with the VSP system. The bigger and more effective canopy of a Smart-Dyson trellis system requires precision water, as well as nutrition management. The rule of thumb is to adjust water and nutrition upwards by approximately one third. This is compared to a similar vineyard on a VSP system. It is advisable, however, to measure the soil moisture, as well as conduct regular soil analyses, to comply with the grapevines’ specific requirements. The Smart-Dyson is one of several trellis systems that enhance the potential of improved production, as well as quality. The extra input in terms of raking out shoots, as well as the positioning thereof, is justified by cost savings during suckering actions, as well as leaf removal actions. Moreover it is a trellis system that fits readily onto existing VSP systems and usually conversion is not a complex procedure. Being a vertical system, it allows for row widths to be narrower thus resulting in extended cordon metres per hectare. 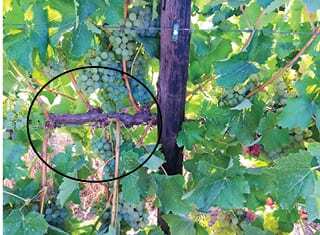 The only obvious disadvantage of this trellis system is that total mechanisation is not possible at this stage and the availability of manual labour is therefore essential. Mechanical harvesting with certain brands of harvesters is possible, however.